Il Fomc ritiene improbabile che i tassi possano aumentare in occasione della prossima riunione di aprile e nel valutare per quanto tempo ancora sarà mantenuto questo target di riferimento, il Comitato valuterà i progressi - sia realizzati che previsti - verso i suoi obiettivi di massima occupazione e il 2 per cento l'inflazione. La valutazione terrà conto di una vasta gamma di informazioni, comprese le condizioni del mercato del lavoro, gli indicatori di pressione inflazionistica, le aspettative di inflazione, e la lettura sugli sviluppi finanziari e internazionali. Gli sviluppi finanziari e internazionali. Quindi i dati economici che usciranno nelle prossime settimane e nel prossimi mesi saranno fondamentali per capire quando la FED aprirà la stagione dei rialzi, se avverrà. Molti analisti ritengono che il rallentamento dell'economia Usa dei primi mesi del 2015 sia imputabile a fattori temporanei, più che altro connessi alle avverse condizioni meteorologiche in molte parti del paese. Tuttavia, avevamo già detto che molti indicatori economici, recentemente, hanno subito il peggior deterioramento dalla fine della recessione. 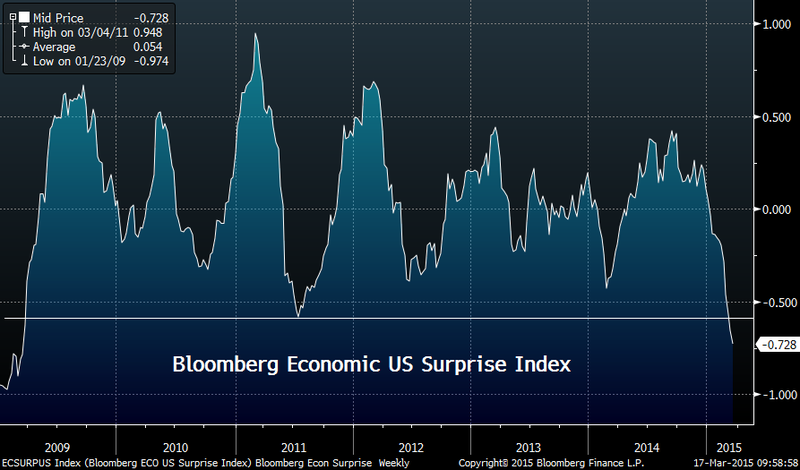 Il deterioramento è confermato anche dal Bloomberg Economics Surprise Index che sta mostrando la serie più persistente di debolezza (rispetto alle aspettative) da marzo 2009. 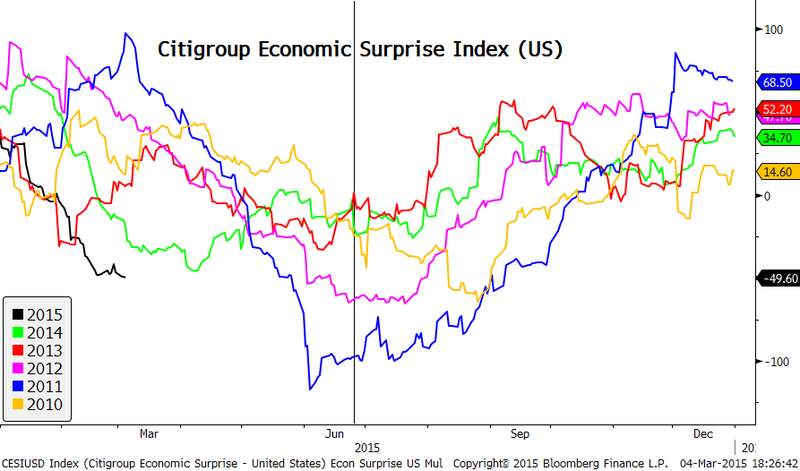 La stessa cosa vale per il Citigroup Economics Surprise Index, che mostra il deterioramento peggiore da 5 anni a questa parte. Siccome negli ultimi anni i dati economici del primo semestre si sono mostrati deboli, salvo, poi, migliorare del corso del secondo semestre, in molti sostengono che il deterioramento dei dati dei primi mesi del 2015 sia solo temporaneo e che l'attività economica migliorerà nel corso dei prossimi mesi. Tuttavia, il ritmo di espansione della crescita Usa resta il più debole degli ultimi 65 anni. Allo stato attuale è abbastanza arduo sostenere la tesi che i tassi possano aumentare in presenza di un quadro macroeconomico che tende ad indebolirsi. Per contro, in molti analisti si lasciano andare nel prevedere anche la possibilità di un Q4 da parte della FED. Allo attuale, chi scrive, pur non essendo troppo sicuro che la FED possa avviare un ciclo di rialzo dei tassi nei prossimi mesi in presenza di un quadro macroeconomico che tende ad indebolirsi, ritiene altrettanto poco probabile che la FED possa lanciarsi verso un ulteriore allentamento quantitativo in assenza di un significativo peggioramento del ritmo di crescita. Pertanto, si conferma che i dati delle prossime settimane e dei prossimi mesi saranno di fondamentale importanza per capire come la FED potrà muoversi. If you believe that ignorance is bliss, you might not want to read this article. 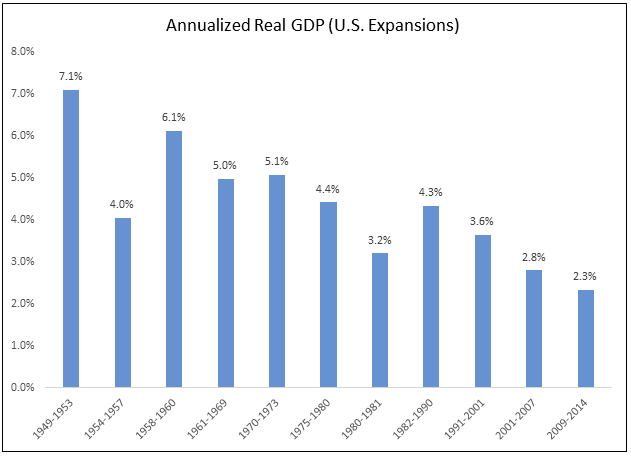 I am going to dispel the notion that there has been any sort of “economic recovery”, and I am going to show that we are much worse off than we were just prior to the last economic crisis. If you go back to 2007, people were feeling really good about things. 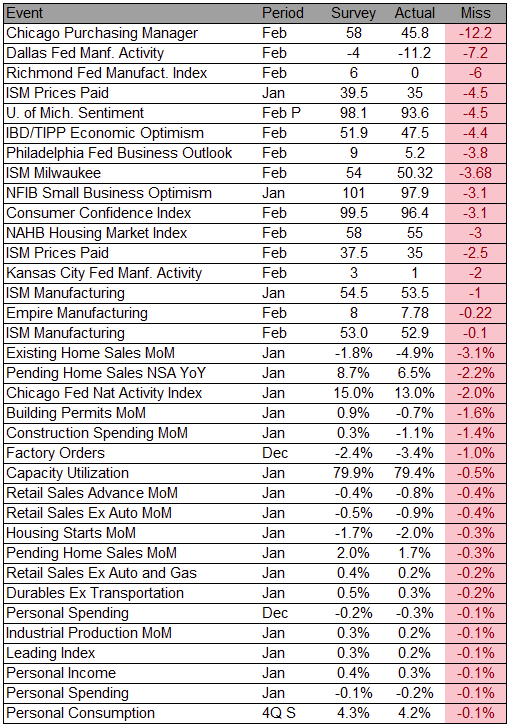 Houses were being flipped like crazy, the stock market was booming and unemployment was relatively low. But then the financial crisis of 2008 struck, and for a while it felt like the world was coming to an end. Of course it didn’t come to an end – it was just the first wave of our problems. The waves that come next are going to be the ones that really wipe us out. Unfortunately, because we have experienced a few years of relative stability, many Americans have become convinced that Barack Obama, Janet Yellen and the rest of the folks in Washington D.C. have fixed whatever problems caused the last crisis. Even though all of the numbers are screaming otherwise, there are millions upon millions of people out there that truly believe that everything is going to be okay somehow. We never seem to learn from the past, and when this next economic downturn strikes it is going to do an astonishing amount of damage because we are already in a significantly weakened state from the last one. For each of the charts that I am about to share with you, I want you to focus on the last shaded gray bar on each chart which represents the last recession. As you will see, our economic problems are significantly worse than they were just before the financial crisis of 2008. That means that we are far less equipped to handle a major economic crisis than we were the last time. 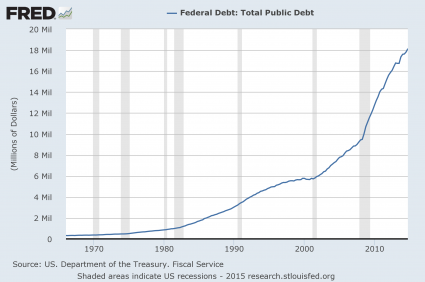 Just prior to the last recession, the U.S. national debt was a bit above 9 trillion dollars. Since that time, it has nearly doubled. So does that make us better off or worse off? The answer, of course, is obvious. And even though Barack Obama promises that “deficits are under control”, more than a trillion dollars was added to the national debt in fiscal year 2014. What we are doing to future generations by burdening them with so much debt is beyond criminal. And so what does Barack Obama want to do now? He wants to ramp up government spending and increase the debt even faster. This is something that I covered in my previous article entitled “Barack Obama Says That What America Really Needs Is Lots More Debt“. Over the past 40 years, the total amount of debt in the United States has skyrocketed to astronomical heights. We have become a “buy now, pay later” society with devastating consequences. 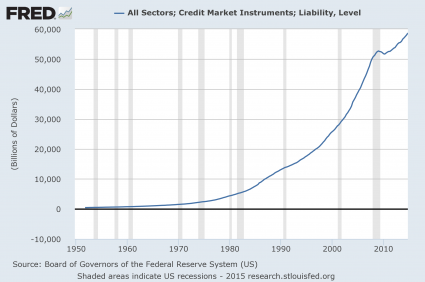 Back in 1975, our total debt level was sitting at about 2.5 trillion dollars. Just prior to the last recession, it was sitting at about 50 trillion dollars, and today we are rapidly closing in on 60 trillion dollars. When an economy is healthy, money tends to change hands and circulate through the system quite rapidly. 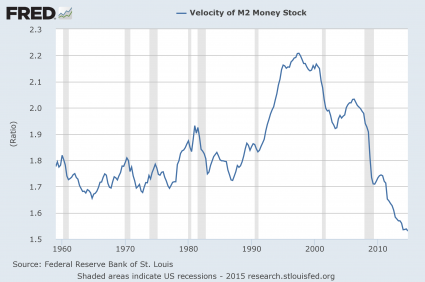 So it makes sense that the velocity of money fell dramatically during the last recession. But why has it kept going down since then? 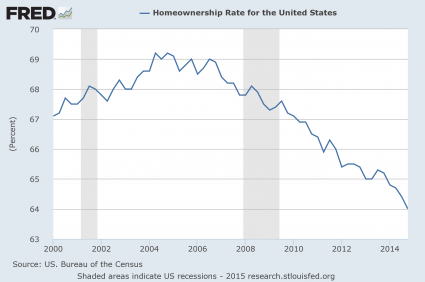 Were you aware that the rate of homeownership in the United States has fallen to a 20 year low? Traditionally, owning a home has been a sign that you belong to the middle class. And the last recession was really rough on the middle class, so it makes sense that the rate of homeownership declined during that time frame. But why has it continued to steadily decline ever since? 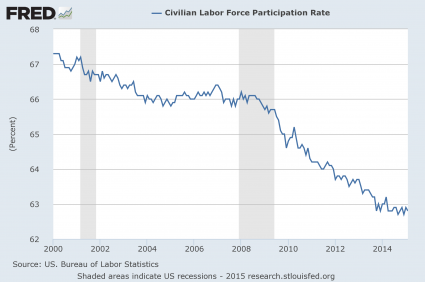 Barack Obama loves to tell us how the unemployment rate is “going down”. But as I will explain later in this article, this decline is primarily based on accounting tricks. 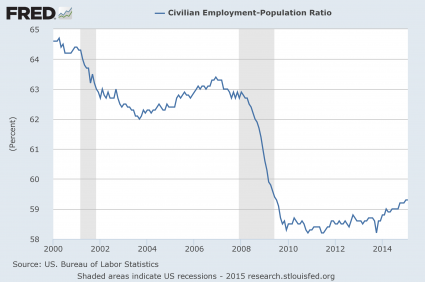 Posted below is a chart of the civilian employment-population ratio. Just prior to the last recession, approximately 63 percent of the working age population of the United States was employed. During the recession, this ratio fell to below 59 percent and it stayed there for several years. Just recently it has peeked back above 59 percent, but we are still very, very far from where we used to be, and now the next economic downturn is rapidly approaching. If things are “getting better”, then why are so many men in their prime working years doing nothing at all? 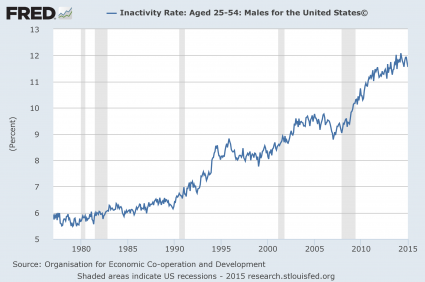 Just prior to the last recession, the inactivity rate for men in their prime working years was about 9 percent. Today it is just about 12 percent. Not only is a smaller percentage of Americans employed today than compared to just prior to the last recession, the quality of our jobs has gone down as well. 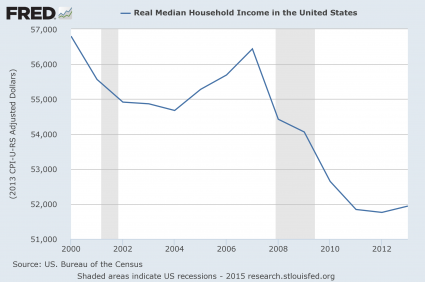 This is one of the factors which has resulted in a stunning decline of real median household income. -39 percent of American workers make less than $20,000 a year. -52 percent of American workers make less than $30,000 a year. -63 percent of American workers make less than $40,000 a year. -72 percent of American workers make less than $50,000 a year. We all know people that are working part-time jobs because that is all that they can find in this economy. As the quality of our jobs continues to deteriorate, the numbers above are going to become even more dismal. Even as our incomes have stagnated, the cost of living just continues to rise steadily. 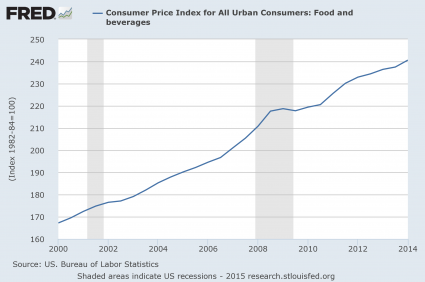 For example, the cost of food and beverages has gone up nearly 50 percent just since the year 2000. As the middle class shrinks and the number of Americans that cannot independently take care of themselves soars, dependence on the government is reaching unprecedented heights. 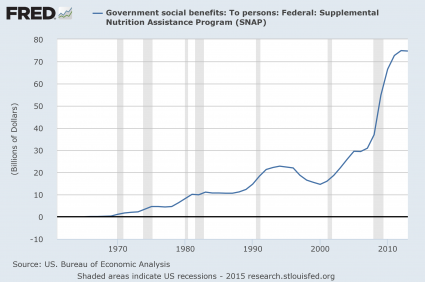 For instance, the federal government is now spending about twice as much on food stamps as it was just prior to the last recession. How in the world can anyone dare to call this an “economic recovery”? So you tell me – are things “getting better” or are they getting worse? To me, it is crystal clear that we are in much worse condition than we were just prior to the last economic crisis. And now things are setting up in textbook fashion for the next great economic crisis. Unfortunately, most Americans are totally clueless about what is going on and the vast majority are completely and totally unprepared for what is coming. OBBLIGAZIONARI EURO HIGH YIELD: FONDI O ETF? AZIONARIO INTERNAZIONALE: FONDI O ETF? QE: DRAGHI USA L'ARMA "FINALE". MA IL BERSAGLIO? GRECIA: CONTROLLO DEI CAPITALI COME A CIPRO? QUANDO FINIRA' LA PAZIENZA DELLA FED? Tema Semplice. Immagini dei temi di bluestocking. Powered by Blogger.